Memories are the threads that bridge families from one generation to the next. The Bridges of Stonecrest program gives residents and their families the support they need for living with memory loss. The Bridges offers seniors with dementia opportunities to thrive. The supportive memory care at Stonecrest is delivered in a kind, compassionate way that is reflective of the resident’s lifestyles, routines and comfort levels. The caregivers understand and respond compassionately to resident's emotions and changing abilities. Our care is designed to draw on the resident’s strengths and allows them to maintain existing abilities while filling gaps in life skills with an appropriate level of assistance. While the reality of memory loss may be difficult, Stonecrest helps build on the best memories possible for residents and their families. 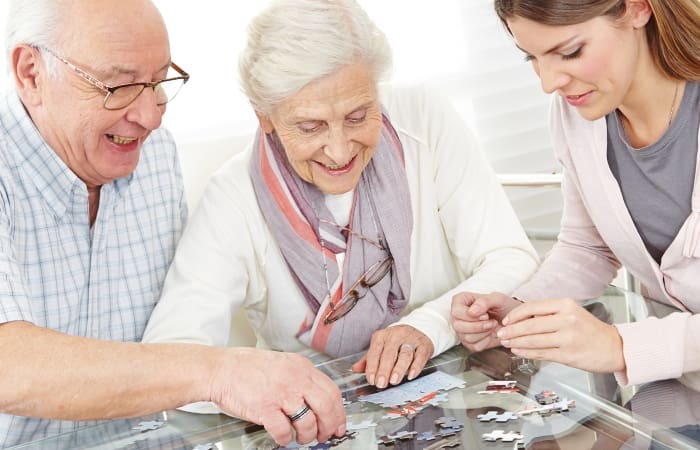 It allows residents to enjoy the simple things in life – connecting and sharing precious memories. Our specially trained team members receive ongoing continuing education with best practices of dementia care. They use progressive techniques to redirect or reorient residents. ​A Thoughtful Approach to Relaxation with Essential Oils, Aromatherapy, Healing Touch and Pet Therapy. ​Trigger Fond Memories through Musical Events & Activities, Self-Expression, and a Personalized Digital Jukebox. ​Open Gatherings are Designed to Provide Emotional, Educational and Social Support for Family Members and Caregivers.